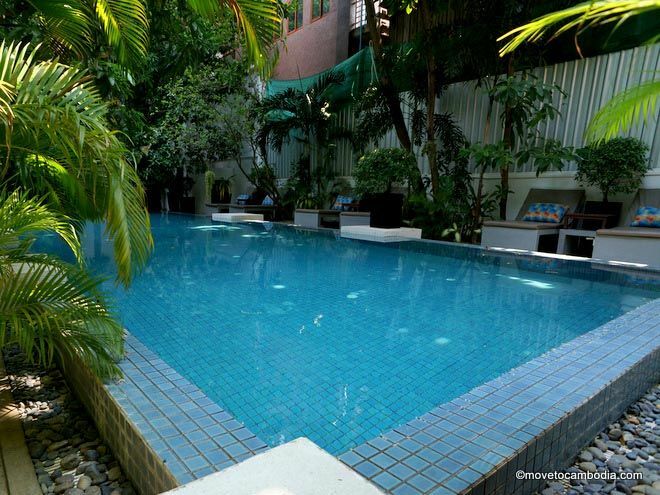 The Blue Lime is a lovely, centrally located boutique hotel that boasts several rooms with private pools. The term “boutique hotel” gets thrown around so much in Cambodia that, like “international school,” it has started to mean next to nothing. Step into the Blue Lime Hotel in Phnom Penh and you’ll be happily reminded of what a boutique hotel is supposed to be. Get a room with your own private pool, or use the hotel pool with the rest of the riff-raff. The Blue Lime Hotel has 23 rooms, of which four have their own private pool. Yes, private pool. These private pools are small but well maintained and have complete privacy from the neighboring rooms. Not that there are going to be any kids spying on you; children under 16 are banned from the establishment. Even if you don’t end up with a private pool, there’s a large pool set in a shaded tropical garden for guests and members of the public who are willing to pony up the $5 day-use rate. Yes, that’s a private pool you see out the back! 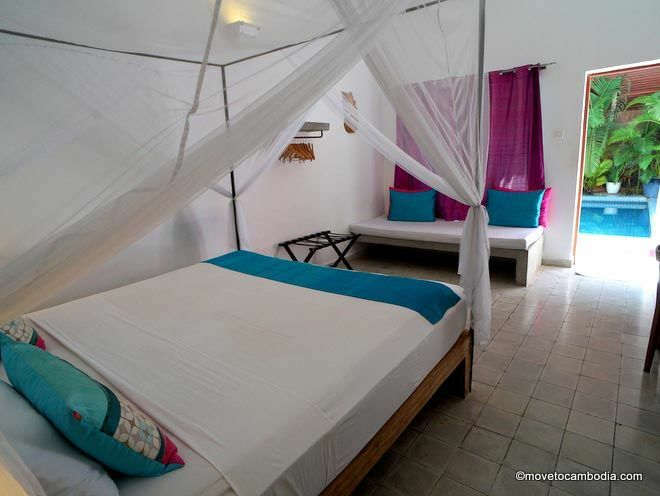 The rooms’ style is similar to those at the Plantation — they are sister hotels — with stark white bedsheets and walls, brightly colored silk cushions and curtains, and, in a nod to Cambodia’s French colonial past, a white mosquito-net canopy. The rooms are not quite as fancy as those at the Plantation, but the prices are about half as much. Rooms have air-conditioning and a nifty, old-fashioned fan, a large flat-screen TV with cable, electronic safe, and hot-water showers and taps (a rarity). Beds have a super comfy pillowtop mattress. There’s wireless internet in every room, but it’s a shared connection and can be slow at times. 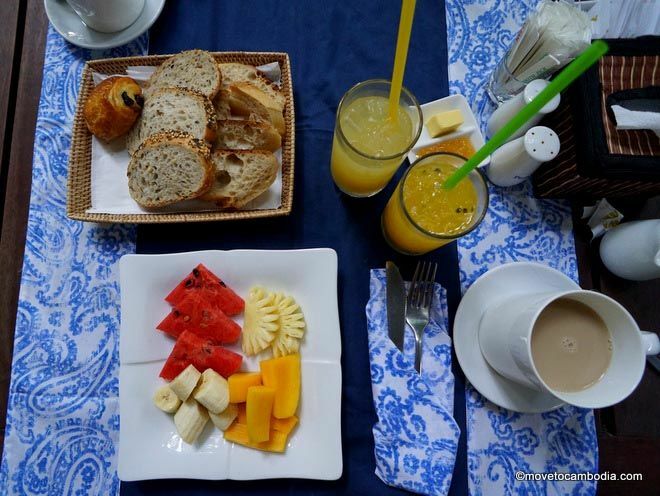 All rooms include breakfast, which comes with several fresh juices, a selection of Eric Kayser breads and pastries with pineapple jam, and a menu of made-to-order items like eggs and bacon. Make room for breakfast. This was before the main course even came. The location is excellent; it’s just behind the Royal Palace and National Museum and walking distance to lots of shopping and dining options. We can muster up very few complaints about the place, although we did get woken up by the cleaning staff going about their business, a pet peeve, but almost to be expected in Cambodia. All in all, the Blue Lime is an excellent Phnom Penh hotel choice; we’d stay there again in a heartbeat. 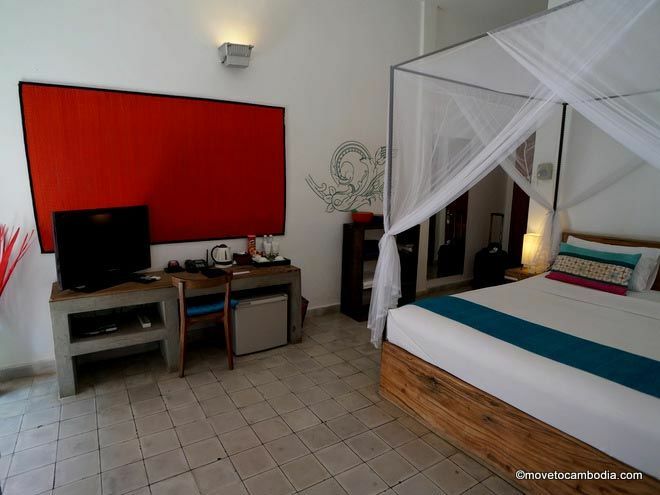 → Check prices at the Blue Lime on Booking.com and Agoda now.